I’ve been rather vocal about my love of the three-song The Disco Before The Breakdown EP before, but through numerous attempts at offering a glimpse at my strange tastes and romantic desires, it’s become a go-to mixtape opener. 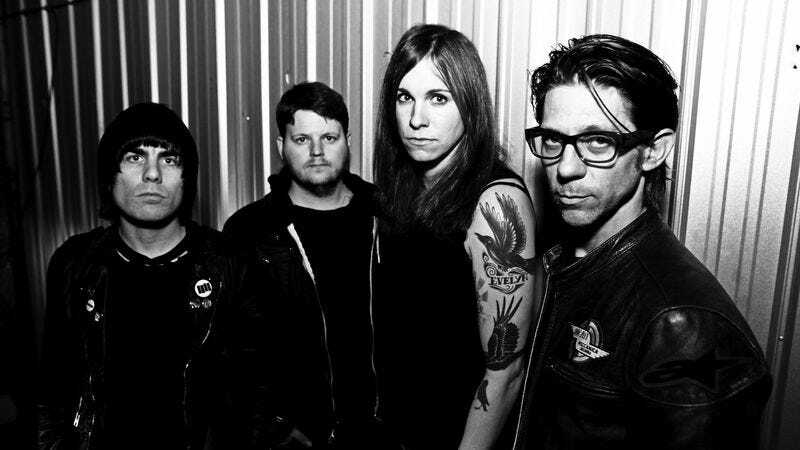 Now, the song remains a bit of an oddball in Against Me!’s discography, with ska-like strikes opening it and a few horns filling in the gaps of each pre-chorus, while guitarist James Bowman’s two-note lead-lines bounce in the background. Yet, for all its musical success, it’s the lyrics that make “Disco” such a necessary inclusion. On the surface the song plays like a simple admission of infatuation, but vocalist Laura Jane Grace would go on to say that it was one of the first songs in which she dealt with the topic of gender dysphoria, a painfully personal topic that she would later address directly. Far be it from me to say that those feelings are ones I could even begin to process, but the way Grace articulates the anxiety, alienation, and fear is what makes the song (as well as this year’s excellent Transgender Dysphoria Blues) so inclusive. We’ve all felt out of place to varying degrees, and in “Disco” there’s an air of blissful defiance that goes along with it. “Disco” expertly describes the hand-wringing nervousness of having to expose something innately personal and emotional to the world at large, like asking someone out, or falling in love (“I know they’re going to laugh at us / When they see us out together ‘holding hands’ like this”) and the possibility that close friends and family members are going to disapprove no matter what explanation is offered (“They wouldn’t understand it if we told them all the reasons / Not that I think this deserves any kind of explanation”). It’s in that closing line of the chorus that Grace bluntly states the universal nature of the situation: That whatever is being wrestled with internally is a facet of that person’s being, and no amount of disapproving glares can make it something worth apologizing for. Regardless of how small the situations may be, there’s likely something gnawing inside each of us, something that we’d be ridiculed or rejected for if it was proclaimed. A decade before Grace declared her lifelong struggle, she encouraged listeners to do the same in their own little ways. Though the meaning of “Disco” has changed over the years, it will always remain a song about embracing inner turmoil, acknowledging fears, and putting yourself out there, even if the only way of doing so is by making it the leadoff track on a mixtape.